Yay! We are 10 today. Gonna do some big-time pawtying today, hopefully, if we can get her off our computer. Anyway, it’s also Valentine’s Day today, so Happy Valentines to everyone. We hope those attending Ranger & Mollies Valentine Ball have a grrrrreat time. 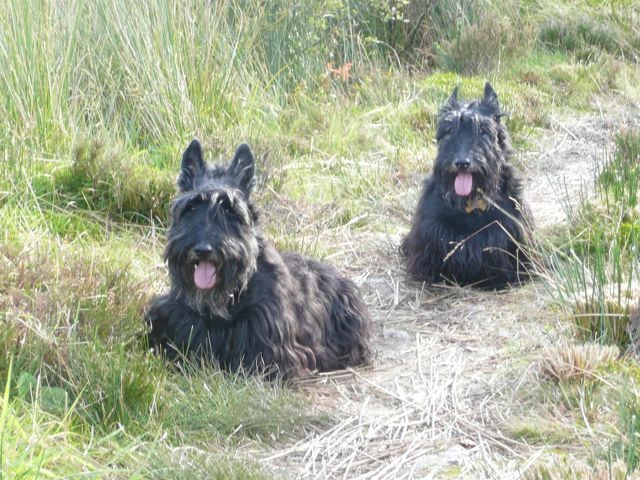 Sorry for being Pawty Poopers, but we just couldn’t get Her organised – she’s been working on some sort of scottie health network or something. We’ll be thinking of you all and waiting impatiently to see all the photos. We hope you all enjoy yourselves. For now, we’re gonna have some good tasty treats today, and if the snow has gone, maybe we’ll get out for a birthday walk. Oh, to be just turned ten again. Happy B’Day, guys. Thanks Kyla. Perhaps we should all remain 10 years of age! Thank you. We have a grrrreat day. Happy, happy, happy Birthday, boys. We know you’ll have a huge celebration for the double digit birthday! Hope you get lots of treats and walks. Happy Valentine’s Day, too. We have a brilliant and grrrreat day. Thanks girls. Happy Valentine’s Day and Happy number 10. Happy Birthday and Happy Valentines Day. I hope you have a great day full of pressie, cake and mostly loveys. We had lots of loveys thank you very much, and of course everything else!!! Happy Late Birthday you guys!